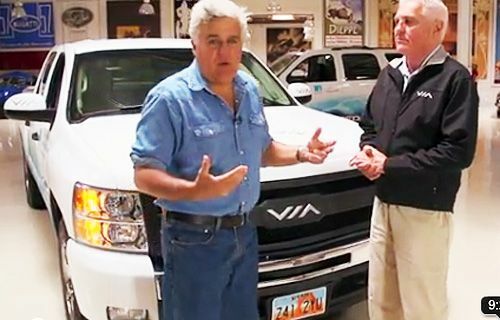 Jay Leno is a believer in Bob Lutz’ Via Vtrux simply because it has all the power and versatility for which everyone loves big full-size pickups, but without the ridiculous gas jones. Let’s face it – gas-guzzlers are the automotive equivalent of petrol junkies. Not that Via’s modified Chevy Silverado plug-in hybrid truck never burns gasoline – but it never uses it to drive the wheels, just to make more electricity to drive the truck – as well as your power tools on the job site. In a power blackout it could even provide power to your house – now that’s versatility. The only problem with Bob Lutz’ vehicles is that right now they cost about $80K. Of course, that’s just a pinch more over than what the serious user of a full size pickup will spend on gas over the next few years, though we might be exaggerating a bit. On the other hand, both Jay Leno and Bob Lutz have Chevy Volts, which basically work on the same principle and have never spent money to fill the tank. The 40-mile a day range of the car works for them, so they are still letting the gas in the tank age and gain bouquet. The Via Vtrux Silverado is driven by a 300-kilowatt electric motor mounted behind the cabin, plus a 24-kH lithium ion battery pack, and like the Chevy Volt can travel approximately 40 miles on a single charge. This difference is, once there, the Via Vtrux can power your tools thanks to 120-volt and 240-volt outlets on the exterior of the truck. It is essentially, a mobile generator than can take you 20 miles to and from on pure electricity, and power your tools while your there. Even at a price tag of $79K, what a boon to the remote or mountain homebuilder or the rancher that needs to maintain fences containing spirited stock. The exorbitant price is why Lutz is targeting fleets with the product. Most fleet trucks drive less than 50 miles per day and then sit idle for at least 12 hours, making electric trucks ideal candidates for their use. The fact they can go up to 400 miles over the electric range if needed takes care of worrisome contingencies. Notably, the V6 generator can always run at its optimum speed, since it is not connected to the wheels. This is partly why a generator is more efficient at creating electrical power than drive – the fact it only has to run at its most effective level of rpms. As recent Torque News articles have implied, if not stated outright, electricity is the future of transportation. At least after the current period of transition expires. They deliver torque and efficiency the combustion engine can only dream of and with no emissions whatsoever. Nevertheless, EVs remain expensive and out of reach of most, but the bottom line is still that you can make your own electricity, but you cannot make your own gasoline. You can collect and refine your own bio-diesel, but that’s another story entirely. My personal advice is buy a hybrid and save your money for an electric car when the chargers are everywhere and the price is even better than a gasoline car. That may well be sooner than you think. Of course, the fact that he's an investor in VIA probably has a little to do with it too..